LAURA ARCINIEGA holds a Master of Divinity from Beeson Divinity School, Samford University in Birmingham, Alabama. She received a Certi cate of Merit in the 2017 Deep River Books’ Writers Contest for her unpublished manuscript Silent Simon. Her work has appeared or is forthcoming in Bombay Gin, Burnt Pine Magazine, Mad Scientist Journal, and Tweet Literature. Originally from Southern California, Laura and her husband Dominic Zappia now live in Bayonne, New Jersey with their son. YUAN CHANGMING published monographs on translation before leaving China. With a Canadian PhD in English, Yuan currently edits Poetry Paci c with Allen Yuan and hosts Happy Yangsheng in Vancouver; cred- its include ten Pushcart nominations, seven chapbooks, Best of the Best Canadian Poetry (2008-17), BestNewPoemsOnline, Threepenny Review and 1,389 others across 41 countries. C.K. DAWSON has her MFA in poetry from Seattle Paci c University. Her work has appeared in Ruminate Magazine, Breakwater Review, Poetry International, Verily Magazine, Serving House Journal, Resurrection Magazine, and is forthcoming from McSweeney’s Anthology. RENEE EMERSON is the author of Threshing Floor (Jacar Press) and Keeping Me Still (Winter Goose Publishing). She lives in Arkansas with her husband and four daughters. MARJIE GIFFIN is a Midwestern writer who has recently had work appear in the Poetry Quarterly, Flying Island, Snapdragon, Words and Sounds, and a teaching anthology. She has taught college writing as well as gifted/talented education and is active in workshops at the Indiana Writers Center. ANDREW GRANEY studies in Seattle Paci c University’s MFA program. He was a juror for the 2017 Delaware Regional Scholastic Art &amp; Writing Awards. Some of his work can be found at Philadelphia Stories, Right-Hand Pointing, and Unbroken Journal. PAUL ILECHKO has always lived by a river, although he sometimes dreams of forests and mountains. He currently lives in Lambertville, NJ with his girlfriend and a cat. Paul has had poetry published recently by Dash Literary Journal, Pomona Valley Review, FishFood Magazine, MockingHeart Review and Slag Review, among others. LAURIE KLEIN’S prose has appeared in New Letters, Ars Medica, Tiferet, Tweetspeak, The Holman Personal Worship Bible, and numerous anthologies, including Voices, 2009, and The Kindness of Strangers. A past recipient of the Dorothy Churchill Cappon Essay Prize for creative non-fiction, she’s also the author of a prize-winning chapbook, Bodies of Water, Bodies of Flesh, and a poetry collection: Where the Sky Opens. Klein’s flash non-fiction appears bimonthly at lauriekleinscribe.com. CHRISTOPHER POORE serves as an assistant poetry editor at Narrative Magazine. His writing has been featured in America Magazine and Image Journal’s Good Letters. He lives in Galesburg, Illinois with his wife, the poet Gina Franco. TRAVIS SCHOLL is the author of Walking the Labyrinth. In addition to poetry, his most recent essays have appeared in Assay and Fourth Genre. He is a PhD candidate in creative writing at the University of Missouri, Columbia, and works at Concordia Seminary, St. Louis. VIC SIZEMORE’S fiction and non-fiction are published or forthcoming in Story Quarterly, Southern Humanities Review, story South, Connecticut Review, Blue Mesa Review, Sou’wester, [PANK] Magazine, Silk Road Review, Reed Magazine and elsewhere. His fiction has won the New Millennium Writings Award and has been nominated for Best American Nonrequired Reading, Best of the Net, and two Pushcart Prizes. 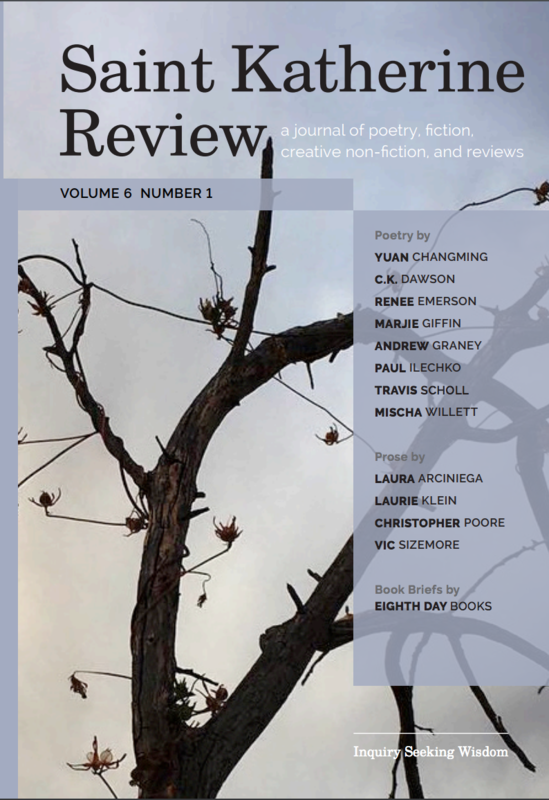 MISCHA WILLETT’S poems, essays, and translations appear in Rio Grande Review, Basalt, Monarch Review, Mockingbird, Mere Orthodoxy, and else- where. A member of the faculty at Seattle Paci c University, he is the author of the book Phases (Cascade Books, 2017) and host of the podcast Poems for the People.